Hortus Camdenensis | Chamaemelum nobile (L.) All. Fully hardy, mat-forming, hairy, aromatic perennial with feathery leaves, to 5cm long, and long-staked daisy-like flowers, to 1.5cm across, in summer. To 30cm. [RHSE, Hortus]. Ancient garden plant. ‘Anthemis nobilis is a very useful herb, and is employed medicinally as a tonic carminative anodyne, and when taken in large doses it proves a powerful emetic.’ [PD]. ‘A common low wild plant of a beautiful green, a fragrant smell, and the flowers not unlike daisies. It is frequent on damp heaths, and hets no good by being brought into gardens. It grows larger there, but has less efficacy. […] The flowers are most used. Those which are raised for sale are double, and they have very little virtue in comparison with the single ones. They are to be taken in tea, which is a pleasant bitter; or in powder they are excellent for disorders of the stomach, and have sometimes cured agues, as many other bitters will. The tea made of them is also good against the Cholick [sic], and workd by urine.’ [Hill p.59]. 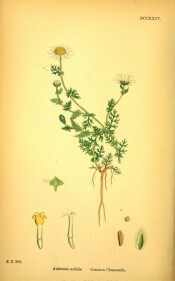 Figured in English Botany. [English Botany fig.DCCXXIV/1863-86]. The only reference to the plant is a handwriiten addition to a copy of the 1850 catalogue in the Mitchell Library collection, inscribed on the cover Wm. Macarthur, 23rd Dec. 1854. [ML 635.9m]. It was certainly grown in the gardens at this time and may have been introduced as a medicinal herb.